The Belleek harp vase is made of fine Irish china and features harp shape handles. The 2008 Belleek Archive Collection is part of the Pottery’s celebration of some of its finest historical pieces over the past sixteen decades. Each one of the pieces, such as the harp vase, represents a specific period within the Pottery’s history and celebrates the many hands that have forged the success of Belleek from its origins in 1857. To make this introduction special, every item in this collection is a limited edition piece and will be individually numbered up to the end of the edition. This Belleek harp vase stands 6 1/2" tall and it features harp shaped handles along with green shamrocks. The fine Irish china vase is handmade and hand painted in Belleek, Ireland and it is gift boxed with a shamrock history card that is complements of The Irish Gift House. 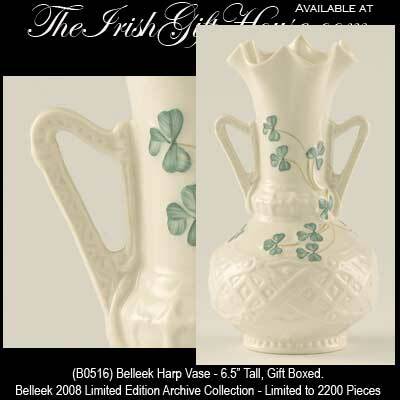 This archive collection Belleek vase is limited to 2,200 pieces.